Frances has been a member of the IDTA for 52 years, coaching children, adults, Professional Dancers and Teachers in all genres in the Ballroom and Theatre Branches. A Fellow and Examiner in the IDTA Theatre faculties since 1972 she has examining extensively in the UK and Europe. Frances has served for many years on the Freestyle Faculty helping to develop the syllabus, and is currently a member of the Musical Theatre Faculty continuing to develop this very popular children’s and students’ performance work. Frances is also a member of the London Meeting and Congress Arrangements Committee. As Principal of MADD College (Midlands Academy of Dance & Drama) for 47 years, this has given Frances a wealth of experience in nurturing the love of dance in children and students for pleasure or for the profession. Frances has three grown up children, one of whom, Emma, is also dedicated to the profession as a Performer, Choreographer and Director. In 2011 Frances was extremely honoured to be awarded the Carl Alan Theatre Lifetime Achievement Award and the Classique de Danse Professional Theatre Award 2011. Linda has been a member of the IDTA for 42 years, holding fellowships in all Theatre genres and has led a highly reputable and respected career as a performer, teacher, adjudicator, lecturer, choreographer and examiner. She is recognized as a leading exponent of jazz dance and has been innovative in her approach to Modern Jazz. Her dancing life commenced at the age of 3 years taking classes in Theatre, Ballroom and Latin. In her teens she pursued a varied stage and cabaret career spanning 10 years as a singer/dancer, performing professionally all over the UK. In 1989 she was appointed as a Theatre Examiner for the IDTA. Linda travels extensively in the UK and abroad examining and lecturing. Her experience includes lecturing at the IDTA London Congress, Area Meetings, Move It , International Theatre Dance Awards, Leicester Seminar, workshops worldwide and has been privileged to adjudicate Miss Dance of Great Britain twice. Her dedication is to encourage our stars of the future. She has also served on the Modern Jazz Faculty for 16 years and is responsible along with her colleagues for the technical syllabus used by IDTA members worldwide. Linda is one of the IDTA’s delegates to the Theatre Dance Council International and was President of the TDCI from 2012-2014. This opened up the complete world of dance and enabled her to meet colleagues from other Associations, together promoting the world of dance. During her time as President she took over the role of hosting the prestigious Carl Alan Awards, this year will be her fourth year hosting this successful event. Linda has been nominated in two categories for the prestigious Carl Alan Awards, and was delighted to receive the Carl Alan Award for Outstanding Services to Dance 2014. With the TDCI she is also on the organizing committee for the British Championships, English Championships and National Championships. Teaching has always been her first love and for many years has specialized in teacher training and is extremely proud of pupils who are now fellow examiners of the IDTA. Alongside her dancing profession she is also proprietor of a large children’s Day Nursery employing fifteen staff. Linda has devoted her life to the IDTA and the world of dance and looks forward to serving all members, working actively to keep up with modern trends and member needs with enthusiasm, dedication and commitment, whilst always keeping a ‘sense of humour’. Philip started dancing at the age of eight and competed in Juvenile, Junior, Amateur and Professional Competitions in Ballroom and Latin. On becoming professional, he found that he enjoyed the teaching side of dancing and has been a member of the IDTA for over 40 years. Philip and his wife Christine have run a successful dance centre in Southampton for 39 years. The school’s base is Medallist pupils, covering many dance styles and offering social events and dance holidays. Philip has been teaching local groups of adults with learning disabilities and has taken them onto the Medal test system. He is now involved with a study by Southampton University on the benefits of Ballroom Dancing for Parkinson’s disease sufferers. Philip also works with many professionals, training them for teaching qualifications, and has trained teachers to Fellowship and Examiner level. His love of technique enabled Philip to fulfill his lifelong ambition to become an IDTA examiner in 1992. Philip has been a member of the South East Area Committee for many years and is a past Chairman. He has been a member of the IDTA Board of Directors for many years and was President in 2005-2006 and 2012-2013, a role which he enjoyed immensely. 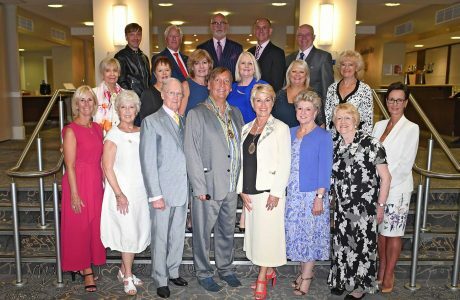 Philip and his wife travelled the length of the country to meet with as many members of the IDTA areas as possible, and has enjoyed his connection with both the Ballroom and Theatre Branches. Colin took his first professional dance qualification in 1967. The Association was then known as the 'International Dance Masters Association'. Since his appointment as an Examiner in the Ballroom branches, he has travelled to many parts of the UK, working in many different IDTA dance schools. Examination work has allowed him to meet many IDTA teachers in their own dance schools, which helps him to understand the challenges they are facing. He has also travelled the world for the Association, lecturing, judging and examining. Colin was elected to the Board of Directors in 1999 and served as President from 2008-2009, he takes great pride in being an active member of the Board. He has gained a great deal of knowledge from serving on many of the various sub-committees and faculties; including the British Dance Council, the London Meeting & Congress Arrangements Committee, the Finance & General Purposes Committee and various others. With his wife Jacqui and two daughters, Cara and Kerri-Anne, he manages two very different types of dance schools. One catering exclusively for social dancers and those who wish to take Medals. The other, original school now caters mainly for advanced dancers, and those who wish to compete and to perfect their dance skills. Yvonne is a Fellow and examiner of the Theatre Branch and is actively involved in many of the IDTA committees including the Ballet Faculty, Overseas Development Committee, Finance & General Purposes Committee, London Meeting and Congress Arrangements Committee and the Selection Committee for Dance Proms. She also continues to develop and build the South East Area. One of the proudest memories of her career was when elected president for 2006-2007 and again in 2011-12. This gave her ample opportunity to travel throughout the country and meet many members. Yvonne pursued a professional career gaining a wide experience in performing arts. Teaching dance and theatre skills became her passion, opening her own school in north London. For many years she produced and directed Young Stars of Tomorrow in London (Dominion, Sadler's Wells, Royalty and Mermaid theatres), these shows being blessed through the attendance of well-known figures in our Royalty. All in all, this kind of work on business elements, and the necessities involved were to help her in years to come. She now specialises in training professional dancers and teachers of who have become IDTA Examiners and also works as a professional coach in all Theatre genres. Carol has been teaching for over 30 years, being involved in Ballroom, Latin American, Classical, Modern Sequence, Freestyle, Musical Theatre and Theatre Craft classes. Her students have entered the International Dance Teachers' Association Medal test system and also Ofqual Grade examinations - from Preparatory Grade through to Grade 3 - in her Studio. She has two daughters; Adele, who is already qualified in IDTA and is a successful professional coach/lecturer in UK, USA and South Korea, and Kate, who has recently decided to embark on obtaining professional qualifications within the Association. She runs a very successful studio - catering for children from 2 ½ years to adults 80 years plus! - covering a broad spectrum of social and competitive dancing, and fully supports the Nationwide Medallist of the Year Competitions and the new IDTA Supreme Medallist Competitions. Carol has also trained many professionals and several of her pupils have been recognised with awards by the IDTA. She is a Fellow and Examiner of the Ballroom, Latin American, Classical Sequence and Freestyle branches. Carol is privileged to lecture, examine and adjudicate both in the UK and abroad. This is something which she enjoys immensely as it allows her to visit other schools and meet other professionals. Carol is a proud and fully committed member of the IDTA and feels very honoured to be a member of the Board of Directors. She is passionate about maintaining the high standard of dance with the IDTA to help keep ‘One Step Ahead’.